The Grand Caravan gets the new Dodge split-crosshair grille, a new hood and quad headlamps. DETROIT -- Dodge is overhauling the Grand Caravan minivan and Avenger mid-sized sedan for the 2011 model year to fit the brand's new youthful, sporty image. Dodge released undisguised images of the two vehicles today. 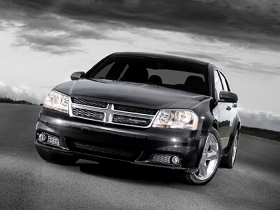 Dodge has upgraded the interiors, suspensions and powertrains of both vehicles. Separated from the Ram truck brand in a corporate reorganization last year, Dodge is pitching itself as a performance brand with an emphasis on driving dynamics. Both vehicles will arrive in dealerships in December. The company has not announced prices for either vehicle. Dodge is describing the Grand Caravan as “a minivan with the driving dynamics of a performance sedan.” Engineers “redesigned and retuned” the suspension, according to a statement. The Grand Caravan will have one engine option: a new, 283 hp Pentastar V-6, mated to a six-speed automatic transmission. The Pentastar replaces three previous V-6s -- the 3.3-liter, 3.8-liter and 4.0-liter. Like most other vehicles in the Chrysler Group lineup, the Grand Caravan's interior is getting an overhaul featuring a new one-piece instrument panel and an available “super” center console designed for commuters. The Stow n' Go seats will be enlarged, and a heated steering wheel will be offered. A “Safety Sphere” package includes a rear park-assist system back-up camera, blind-spot monitoring and rear cross-path detection. Four configurations will be available: Express, Mainstreet, Crew and “Man Van,” a R/T performance version of the Grand Caravan. 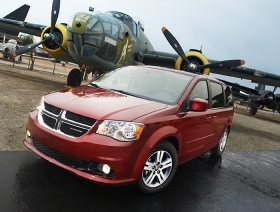 The Grand Caravan will be built at Chrysler's Windsor assembly plant in Ontario. The Avenger's sheet metal remains unchanged, but the car will get some tweaks including a new front fascia with the new Dodge grille. Engineers widened the track of the Avenger by an inch and lowered the vehicle in the front and rear for a “more aggressive stance.” The car also will get wider tires. The standard engine will be Chrysler's 2.4-liter, four-cylinder World Gas Engine, which has been recalibrated and now will be connected to a six-speed automatic transmission. The Pentastar V-6 also will be offered. Inside, the Avenger will have a new instrument panel with new bezels and gauge faces and the new Dodge-three-spoke steering wheel. The Avenger will be built at Chrysler's Sterling Heights assembly plant in Michigan.